In a completely unexpected and stunning move, the Blackhawks have traded Brandon Saad to the Columbus Blue Jackets in exchange for four players and a 2016 fourth round draft pick. Stan Bowman had stated on more than one occasion leading up to this summer that his number one priority was to re-sign Saad this offseason and that he was confident he could do so. Unfortunately, it is now clear that the two sides could not come to an agreement on a contract, thus leading to the trade. Obviously this one hurts, a lot, but let’s break it down here and really take a look at what this trade means. First off, it is being reported that Saad was looking for a deal worth about $6.5 million per year for 6 years. If that is in fact true, then there’s no way the Blackhawks could have signed him to that deal without having to dismantle their roster. With the Hawks as tight against the salary cap as they are, two million dollars is a lot of money. If Saad was looking for four million per year, then he doesn’t get traded. This isn’t like the MLB where a team can sign players to huge deals left and right. In this case, what seems to be not a huge sum of money (two million), is in fact just that. Match whatever offer sheet Saad signed, thus forcing them to make possibly even more trades than we were all expecting and putting them in an unfavorable position for the near future. Don’t match the offer sheet and receive a handful of draft picks in return that may or may not pan out to be good NHL players. Given that situation, Stan Bowman and the Hawks chose to trade Saad now before he became an RFA. Artem Anisimov: Anisimov (27 years old) is a solid two-way player who can be placed at center or on the wing, making him a valuable asset to the lineup. He registered 27 points (7 goals, 20 assists) last season with Columbus, but my immediate thought is that those numbers will quickly rise now that he’s in a star-studded lineup with the Hawks. His ability to play center and win faceoffs makes losing Richards and/or Vermette easier to handle. Marko Dano: This guy is just 20 years old and is viewed as one of the better prospects in the game. He has some tremendous upside and could very well end up being a big player on the Hawks for many years. As a winger, he could find himself on the Hawks’ third line next year. Jeremy Morin: No, that is not a misprint. Morin is back with the Hawks after being traded away to Columbus this past December. If you’ve forgotten, Morin is a hard nosed winger who isn’t afraid of battling along the boards or standing in front of the net. He has shown some good potential at the NHL level, but hasn’t been able to put it all together yet. Whether or not he starts in NHL or AHL next year remains to be seen. That’s if he doesn’t get traded again before the season starts. Corey Tropp: Tropp is a 25 year old right winger who tallied just 8 points with the Blue Jackets in 61 games last year. And to be honest, that’s all I really know about him. In addition to those four players, the Blackhawks also received a 2016 fourth round pick from Columbus. 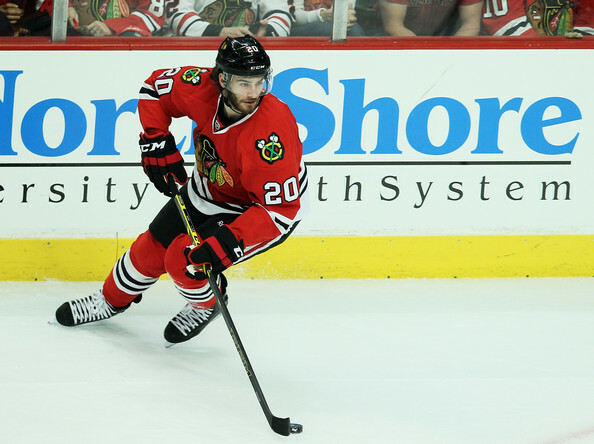 When you look at the return for Brandon Saad in this deal, there’s reason for optimism. Artem Anisimov is without question a nice pickup and could be quite valuable for the Hawks immediately. He ensures that the Hawks will have some nice depth at center for next season, as they already have Toews, Teravainen, Kruger (assuming he gets re-signed), and Phillip Danault, who is expected to see more NHL time. This also means that we may not see Brad Richards or Vermette back. It wasn’t likely that Vermette would have been back anyway, but Richards seemed to be a real possibility. Him coming back is still not out of the question though. Marko Dano, as I mentioned, figures to be part of the Hawks’ future for sure. He has some real goal scoring talent and is just 20 years old. When you add in the fact that they already have an incredible talent in Teuvo Teravainen, who is also just 20, the Hawks up and coming players could make them quite scary again, and soon. It’s possible that the Hawks turn around and trade Morin, Tropp, or even Dano (not likely) along with Bickell or Sharp to get a bigger return. I personally can’t see Morin playing another game for Joel Quenneville, who clearly doesn’t like what Morin brings on the ice, so maybe he’s the best bet of the three to get traded again. Whether this theory holds true, who know? It’s just a theory. What’s not a theory is that the Hawks do still have to trade Sharp and/or Bickell to open up more cap space. If they can trade both, which would be ideal, they could afford to go after some free agents that they probably couldn’t have before trading Saad. They could also seriously look at bringing back Oduya and Richards. So while none of us are happy to see Saad go, and I’m still stunned by it, the more you look into to it, the more it appears that this was a move that needed to be made. And if Bowman can deal Sharp and Bickell, that would allow the Hawks to makes some moves to help them in the long run. While it’s easy to be pessimistic right now, there is still a lot of reason for optimism when you look at who the Hawks just acquired and what they could still potentially do this summer. Over the last week or so, a bunch of different names have been mentioned throughout the NHL as possible candidates for being traded. A good handful of those names are big name, superstar players, which makes the trade rumors this summer all that more intriguing. A couple of those names are current Blackhawks. It is not often that Stan Bowman looks to trade away any of his top players, and while this offseason may be no different, one cannot help but speculate as to what could potentially happen in Chicago this summer. The past few days have been very interesting. For the first time since I can remember, I have heard the names Patrick Sharp and Brent Seabrook mentioned as possible players the Blackhawks may look to deal this offseason. Keep in mind that these are just rumors, meaning that there really isn’t any way to know whether or not the Hawks are actually looking to trade either of those guys. If those rumors are in fact accurate, then some conclusions can be drawn from them. Patrick Sharp is due to make $5.9 million a year through the 2016-17 season. Brent Seabrook’s contract is for $5.8 million through the 2015-16 season. Trading away one of those players opens up a TON of cap space for the Blackhawks, allowing them to acquire a big name player to fill some gap on the team. The only way either Sharp or Seabrook is traded is if the Blackhawks know they will be getting a star player in return or via a separate trade. So, who might the Blackhawks look to acquire this summer? The names Joe Thornton and Ryan Kesler are popping up left and right in regards to the Blackhawks. Both players are supposedly being shopped by their current team, and both the Sharks and Canucks are going to want something of significance in return. Thornton is due to make $6.75 million per year through the 2016-17 season, and Kesler is set to make $5 million for two more years. If the Hawks were to in fact go after one of these two, we would likely see Patrick Sharp going the other way, or to some other team to free up the cap space. A story surfaced shortly after the Olympics that Patrick Kane went to the Hawks’ management and basically said “If you can get Kesler, get him.” Again, who know’s if that actually happened. However, it is no secret that Kane and Kesler have developed some chemistry together via international play, and I would guess that Kane would welcome him with open arms to the second line on the Blackhawks, seeing as how they currently don’t have a true number two center. The bottom line is that I do believe there is some validity to the “Kesler to Chicago” rumors, but I’m not sure that the Blackhawks would be willing to part ways with what it would take to get him. AKA Patrick Sharp. As for Joe Thornton, I don’t see the Hawks making a move at him. Obviously, he would be a huge boost to the team and would probably elevate Kane’s statistics to ridiculous numbers, but his salary and the amount it would take to get him seem to both be too high for the Hawks. That’s not to say the Blackhawks won’t inquire about him, but I don’t see them making a serious push. Someone I haven’t mentioned yet, Johnny Oduya, could very well be dealt in the next month, however. He is entering the final season of his contract and is set to make $3.375 million this year. Trading him opens up the cap space to sign a defensemen or two, or to acquire some depth forwards via trades or free agency. I’d say the chances of Oduya being a Hawk next year are 50/50 at this point. What will most likely happen is this: The Blackhawks will kick the tires on a couple of big names who are being shopped, but will refuse to give up what it will take to acquire such a player. They will fall back on the fact that they have Teuvo Teravainen waiting in the wings down in Rockford, and he will most likely get the best chance of anyone to occupy the Hawks’ second line center position come opening night. Johnny Oduya will be traded for a prospect or two and a draft pick, and the Blackhawks will fill his roster spot with a guy like Adam Clendening, Stephen Johns, or Klas Dahlbeck, all of whom are in Rockford and NHL-ready. The Blackhawks will also sign a depth defensemen or two, as well as a depth forward. The lack of talent on the Hawks’ fourth line was a huge reason as to why they were eliminated by the Kings. Rolling just three lines in the late stages of the NHL playoffs is not a good thing, and I am hopeful the Blackhawks will address that problem this summer. Really, anything could theoretically happen between now and opening night of next season. Someone like me can only speculate as to what that may be. TSN’s Bob McKenzie reported this afternoon that the Blackhawks had traded a fourth round draft pick to San Jose in exchange for center Michal Handzus. As I said here before and as was made obvious by the Blackhawks themselves, they really wanted to address their faceoff issues by acquiring a center who can win at the dot on a consistent basis. Handzus, who is listed as 6’5″, 215 lbs., has won 55.6% of his faceoffs this year, which immediately makes him the second best guy at doing so on the Hawks’ roster. As for Handzus’ stats, they are not great to say the least. He has 1 goal and 1 assist this year, both of which came in the same game earlier this season (it was actually a game against the Hawks). I’m not sure that Handzus is the number 2 center that the Blackhawks and us fans were looking for, but he adds depth and another option at the center position. It is unclear as to what line he will play on, but I can almost assure you that he will center their second powerplay group. With his ability to win faceoffs and his large body, he is a perfect guy to insert into that number 2 powerplay unit. I’d have to imagine that he will be used in front of the net to screen the goalie and clean up the rebounds. Aside from his faceoff percentage and inevitable role on the second powerplay grouping, Handzus provides some much needed size to the Hawks’ lineup. His 6’5″ frame makes him the tallest guy on the Hawks and a tough guy to play against. I think that his physical stature will really become noticeable come playoff time. I read earlier today that the Blackhawks were talking to Dallas about possibly making an offer for Jaromir Jagr. Like with Derek Roy, it sounds like the Stars want a prospect, draft pick, and roster player in return for Jagr. That’s a lot to give up, but if the Blackhawks think that it will be worth it for Jagr, he would be a huge addition to the lineup. This is only a rumor, so who knows what will happen in the next 48 hours. Keep checking back here for any updates.